V55V's Rhombics - A Big Signal Out of Africa! Discussion in 'Amateur Radio News' started by DK7PE, Mar 9, 2018. Guys had already read about rhombic v Yagis and gain per acre etc a few years back, had also read about w6am amazing setup it should have been kept. Ok it's not the king of antennas. But put me in the centre of a daisy rhombic and I would feel like I was in heaven. No waiting for a rotator to turn, every direction and every band. Even a single rhombic unterminated (I know the acreage involved before we go there)in Ireland we are in a good position we can work Europe and states on a bidirectional antenna which would cover 85 percent of ham community. KI6PMD, NH7RO, DK7PE and 1 other person like this. V51E is my best DX on 6 meters. 9800 miles or so. Worked on 3/9/91. Mine comes in around 9300 miles between Tazmania and Biloxi, MS on 6M SSB. Shades of Don Wallace - W6AM. Don was legend for a crushing signal. I worked Don in the 80's as a teenager. Good guy. One hell of a station -- now the antenna farm acreage is nothing but new homes/condos. KB2QQM, MI0YLT, NH7RO and 1 other person like this. Ten Watts and a small 3 over 3 el stack. NH7RO and KM1H like this. In the 60's I operated from the top of Mt Eqinox in VT. Gear was a HQ-129X, HB 6M converter, CE-10A, HB TX converter with about 10W out on CW/SSB and 3/3 Hilltoppers. A small generator on the ground and a 53 Chevy wagon with a small table and a sleeping bag. I was the first reported 6M SSB station from VT (and first VT period for many) and had mini pileups going. Worked down to VA on tropo and out to Ohio on morning meteors. Worked from that location many times with increasingly better gear until moving to Chicago in 70-73. NH7RO and NL7W like this. That video only has one thing wrong with it. It was not long enogh. I realy enjoyed it. Yes Rhombics do work. Even the smaller vertical rhombic like I set up in the Malaysian jungle in 1968 to use on the end of my A41 Manpack Brit Army radio. On low band VHF tuned via a lashed up Pi configed ATU and a 400 Ohm term resistor at the far end. I had the Pioneers cut me a 30 odd feet length of bamboo for a mast and also chopped me a path through in line for the ground return wire. The Brigade Rebro had gone dead in-between Bde HQ and our Batalion . Only a hundred and some miles total, but on the 1 watt out-put of a A41 radio- no chance. Up went the vertical half Rhombic, a slidex mesage sent to Bde HQ asking for permision to work to them direct and the answer that Pronto- the Bde Signals officer was on his way over in a helicopter. When he arrived he gave me a rosting for not putting a red light at the top of the mast (joking). He was quite impresed and wanted to know were I had come up with the idea for the antenna. To cut a long story short I more or less explained that it was a project I had been working on back in Germany (BAOR) and just happened to have it with me. Has you do stuck out in the jungle. I had used it to work from Hildesheim up into Denmark were some of our guys had gone up there in Rovers to carry out the trials. 73 de John - G0WXU. NH7RO, DK7PE, KB2QQM and 1 other person like this. 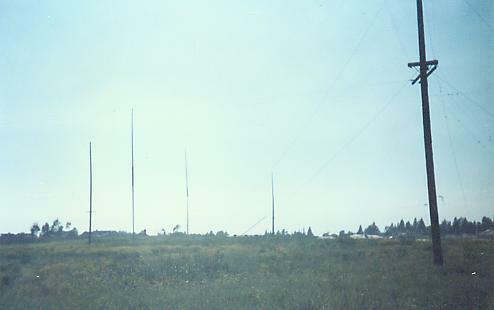 Another myth (working on it for the past 40+ years), when the propagation isn't there, only smoke signals will work, they don't need 1500 foot antennas. In the contrary, if propagation is good, I use my wet noodle and make contacts all over the world, being barefoot. Alles gute in der Heimat, hat sich sehr veraendert in den letzten 30 Jahren! DK7PE and KR3DX like this. Rhombics are dream antennas.. What a beautiful property they had. The Spirit of Amateur Radio. I wish the rest of humanity could learn something from it. We are only here for a short time. Enjoy it. Love Others and share..it really is so simple. I was drawn to this movie and the DX as I didn't go to bed until 4am this morning. I bought my first new radio in a decade and I was lucky enough to work VK7DD in Tasmania on 30meters digital FT8 at 3 am this morning. 0900Z. 10,000 miles away with my puny little 50 foot vertical and 40 watts. I was contemplating my 40 watts signal at the speed of light going 10,000 miles. We take it for granted really, how really incredible radio and electronics is. I only think like this when I have sleep deprivation. It causes me to slow down and think..lol. NL7W, MI0YLT, NH7RO and 2 others like this. I think we all dream of a better antenna. I am working on a Transmitting Loop for 80/40. Maybe I will just buy the Ciro Massoni Italian loop. Best bang for the buck on a property with zero trees. MI0YLT, NH7RO and DK7PE like this.